Over the past two months, MacKay Creek estuary has undergone an amazing transformation. The estuary’s revival is the keystone project in HCTF’s Burrard Inlet Restoration Program, a pilot created using funds from a creative sentencing award and designed to maximize habitat benefits through innovative partnerships. 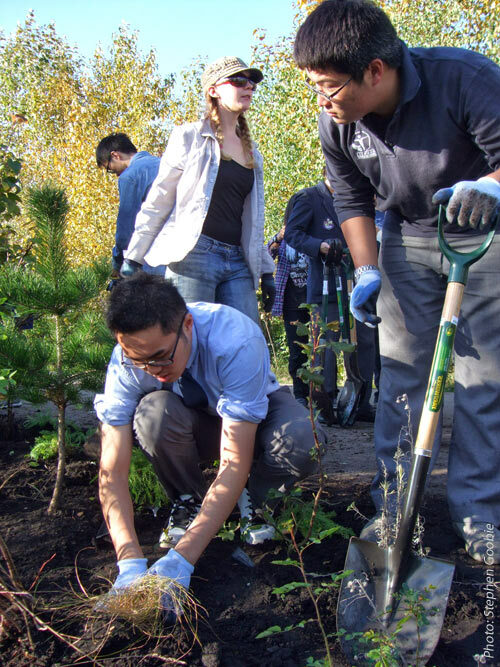 One of the project partners is Bodwell High School, located just steps away from the MacKay Creek restoration site on Vancouver’s North Shore. The restoration of the MacKay Creek estuary began in September with the removal of a large concrete weir which had previously prevented migrating chum salmon, coho salmon and cutthroat trout from entering the creek. Next, the elevation of the estuary’s tidal benches was re-graded, creating a substrate that could support saltmarsh vegetation such as eelgrass and sedges. Large pieces of wood were strategically placed in the water and the tidal benches, both to provide refuge for fish and wildlife and to help discourage Canada geese from overgrazing the new vegetation. Once the heavy equipment work was complete, it was the students’ turn to start planting native species along the banks of the estuary. Bodwell’s Green Team, mentored by teacher Bianca Ferrajohn, had previously been involved in removing invasive plants from the area, and students were eager to get on with the restorative phase of the project. Julia Alards-Tomalin, who had been coordinating a recently graduated team of Squamish Nation ecological restoration students planting within the estuary, showed the Bodwell students how to pick a good location for their seedlings: for many of them, it was their first experience planting. Because the students routinely walk by this area on their way to and from school, they will have the opportunity to see their work flourish in the coming months. The Green Team includes 33 students representing many different nationalities; Bodwell prides itself on being incredibly diverse, with current students originating from 38 different countries. School President Paul Yuen sees the MacKay Creek project as an excellent hands-on learning opportunity, an experience that could potentially inspire similar work abroad. “Most of these students come from developing countries and they have a lot of challenges in their environment,” said Yuen. “We are going to mobilize the whole school community to be taking part, to be observing, to be helping, to be getting their hands dirty, and hopefully they can bring this back to their own country.” Improving the functionality of estuaries such as MacKay Creek undoubtedly provides significant ecosystem benefits, but the added value in these urban restoration projects is their potential to inspire future conservation efforts, far beyond Vancouver’s North Shore. The opportunity for students and adults alike to so readily experience even a small taste of what these landscapes were like pre-development and degradation is a vital step in moving towards urban landscapes where nature and people can co-exist, and even thrive. 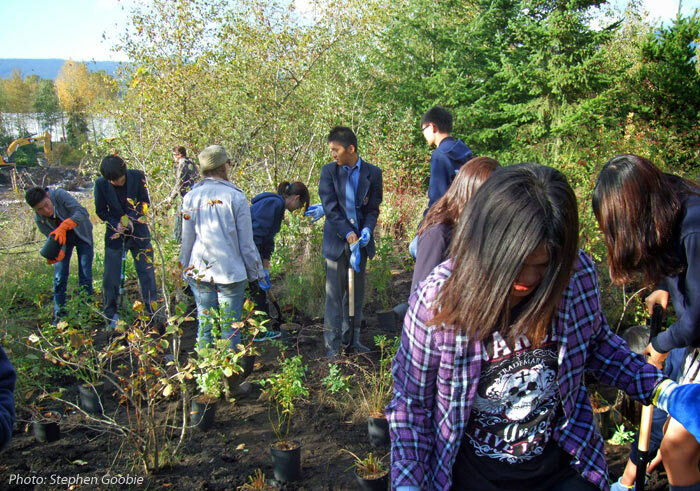 The success of the MacKay Creek Restoration Project was made possible through the contributions of the many organizations who partnered with HCTF on this project: Northwest Hydraulics, Seaspan, Squamish Nation, City of North Vancouver, Nature Conservancy of Canada, Living Rivers, Bodwell International School and BCIT.